ROSSI - L'America Meridionale . . .
ROSSI, G.G. - L'America Meridionale . . .
L'America Meridionale . . . - ROSSI, G.G. Title : L'America Meridionale . . ..
Map maker : ROSSI, G.G.. Size : 15.5 x 21.7 inches. / 39.4 x 55.0 cm. 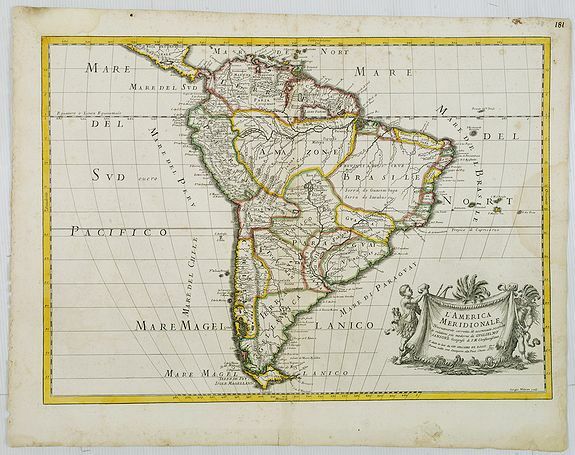 Description :Second edition of Rossi's map of South America, based upon Sanson's map, but with revised Italian nomenclature. From his 'Mercurio Geografico...'. The engraver was Giorgio Widman. With large title cartouche in lower right. Condition : A dark impression. Marginal light staining and age-toning of paper. A larger water stain in right hand part affecting the engraved area.